Prior to WWII, Britain was importing 75% of its food. When war was declared in September 1939 the German army attempted to weaken Britain by attacking the cargo ships with its U-Boats and E-boats. In response to these attacks, the British Government launched its Dig for Victory campaign in October 1939. Citizens were urged to turn every available piece of land into vegetable patches. The campaign was enormously successful and it is estimated that there were 1 400 000 allotments in Britain by the end of the war producing 1.3 million tonnes of food. Potato pasty was one of the way British housewives used produce from their gardens and allotments to supplement limited flour rations. Cream the fat and potato until smooth. Work in the flour and salt and mix to a stiff consistency with water (if necessary). Not too much water is required for potato pastry, as care must be taken not to make it too moist. Two cartoon characters, Potato Pete and Captain Carrot, lead the Dig for Victory campaign and featured in many of the Food Facts pamphlets published by the Ministry of Food from 1940. Rationing and the Dig for Victory campaign feature in my new book While the Buzz Bombs Fell – coming soon. This information about potato pastry is new to me. It makes sense that it was an economical way to fill up the stomach. Look at Potato Pete – great you found out those vintage advertisements! Thank you for reading, Christy. Potato pastry was new to me too. I have managed to get my hands on a very old cookbook from WWI which is so interesting. I will be sharing some of the advice and recipes here. It’s important not to forget past eras, or the knowledge they had. I think what you’re doing here is important. Thank you, Craig. I think it is important to remember the difficulties of living through a war. Hopefully such recall will help avert another. I’m really looking forward to your new book, Robbie. The war years (first and second) are fascinating historically. I must say, Kim, I have learned so much from writing this book. I thought I knew a lot about the war but it was all factual. I didn’t know about living in a war – daily life, that is something entirely different. Captain Carrot! This is interesting information, Robbie. 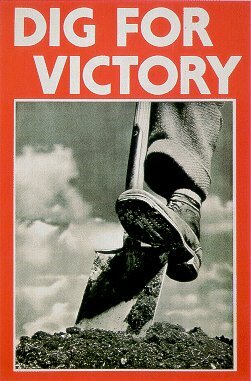 America also had victory gardens. Funny how war brought new recipes. Thank you, Charli. I actually came across a few write ups on the American victory gardens. There were also war recipe books and canning initiatives that arose. Hi Robbie. Is there any way to make the font larger from your side? I’ve been working on a potato bread recipe that was popular during this campaign. I am sure there is, Tandy. I will be making other changes to the site and will also get this change made. Thank you for reading.